That's an awfully big log home. And check out the trellis-covered walkway. Notes on the reverse indicate it is named "Sonny," located at Mitchell's Point, and a Mr. Parker was the builder and owner. The automobile in the foreground has a license plate from the 1920s. That would be the old location of the OCH down front, I assume? Yes, the Columbia River Highway went right past this house. Apparently Mr. Parker owned the "Little Boy Ranch" just west of the Mitchell Point Tunnel. I presume this house was part of the ranch. Not sure if any of it remains. Wow! I think that is a lovely house and setting. Yes, what a lovely house and setting, with a view of the River. That arbor walkway is unique, and I wonder what the purpose was. The hill behind the house is terraced and it looks like a road beneath it. The August 22, 1915 Oregonian page 10 has an article about C.W. Parker and Little Boy Ranch. There is a photo of Parker and a photo of the home. I wish I could copy the entire article, but here are some highlights. Inside and out, the home of Mr. and Mrs. Parker is one of the most unique in Oregon. Mr. Parker has been in newspaper work both abroad and in America. The entire main floor of the Parker home is given over to an enormous living-room. Two cavernous fireplaces, one at either end of the building, throw out a glow of cheer....Around the entire home runs a broad, glass-inclosed veranda....the west view from this porch is declared one of the best the entire length of the Columbia River. The Little Boy Ranch home was completed four summers ago. "I knew then, that it would only be a question of time until the highway would be built along the Columbia. The Old State road passes through the terrace-like pass over Mitchells Point to the rear of the Parker home. The new highway takes a lower level, sweeping in a graceful curve directly in front of the place. About 100 yards to the east of the home, is the wonderful open-window tunnel. Mr. and Mrs Parker have a large Summer camp on Lake Michigan. However, they have not lived there since they chose the present location of their Oregon vacation home. He explains that the White Sox, rather than going south for training, played early season with local amateur teams. He played with a team against Rev. Billy Sunday. Rancher Buys 200 Acres. Owner of Place on Columbia Highway Will Beautify It. C.W. Parker, owner of Little Boy Ranch just west of Mitchell Point, where the state soon will begin the expenditure of $50,000 on the Columbia Highway, has purchased from George Martin an adjoining tract of 200 acres. Only a small portion of the land is tillable. A valuable stream crosses it, however and this will be used by Mr. Parker in beautifying the grounds of Little Boy Ranch. The grounds of the place will be sown to grass and many shrubs will be planted. A dynamo will be installed and the residence and grounds lighted by the electricity. George Martin and C.W. Parker, who own the west base of the cliff, also are protesting against a change in name. OK, I spoke with ODOT's historian to clarify this location. 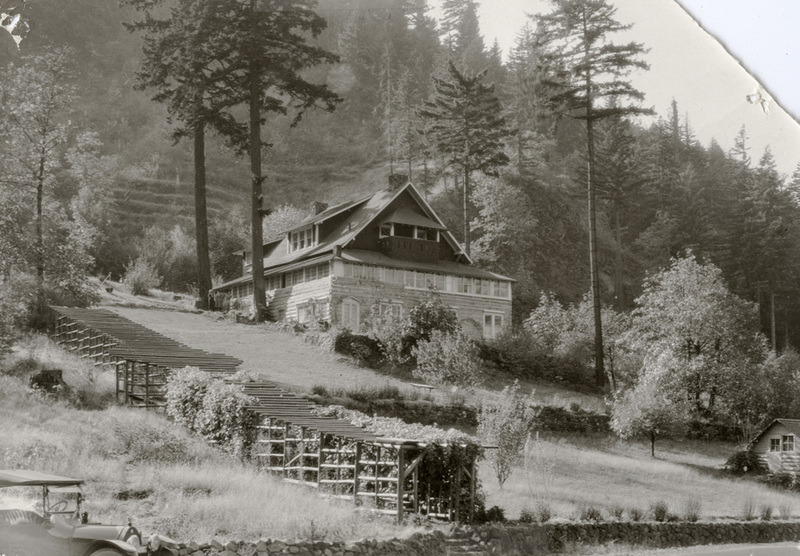 There was a motel and cabins at the west portal to the tunnel, immediately south of the current parking area. This house was up behind the hotel, just west of the cabins. That car would be at the edge of the current parking area. I'll post some pictures later to show the whole area. The answer to why it is called Little Boy Ranch. The article explains that he is the first of five boys that Mr and Mrs Parker plan to adopt and take into their large country home....Mrs. Parker says she wants the home full of youngsters. The concrete motel foundation in front of Sonny is still extant with a stone retaining wall 4' behind it. This was a modern motel that replaced an earlier one beside the "new" highway. I was once in trouble with a gorge commission person I will not name for cutting ivy off the concrete to make it visible, but state parks has since removed all the ivy which still needs yearly maintenance. The route to the top of Mitchell passes, just above the house site, the slab that was an electric plant. Above the second switchback of the trail is a concrete water box but the peaked wood top I remember has long ago collapsed and it is partially hidden by a downed tree. Both sites are marked by my amateur efforts at sign making, and there are good stories on the internet of the building later used as a road house. Time for onsite survey !! We know some foundations remain .... but perhaps they are lower than this residence ? Might any terraces remain ? Arthur. - What was you source for his photo as I’ve never ever seen it. Steve, when you visit go uphill, across the small creek and wagon road, and there are (or were) remains of a corral with water tank. Down the wagon road west of the creek is some nice rock wall from the military road construction. Thanks Ken for all of your directions. I printed this page and put it in my purse. Plan to pull off at Mitchell before spring when the trees leaf out and block the views. Stever, we have a small biographic file for the Parker's at the museum. I suspect this photo came out of that folder though it was not filed that way. The folder has some other views of the ranch house too, though not as nice as this. Neat to spy the power line as a reference point perhaps and the two indiviuals at the SE corner of the home along with the chair and table mid slope. The two rock walls still exist, the motel was between the two. The lower one is the 1915 highway and there is still concrete from the motel foundation. The shaded arbor walkway led down to the original highway in front of the house (the wagon road is behind the house), Notice steps down through the rock wall to road level.